There's still time to take advantage of our March Madness promotion! Save over $2,000 on a new website, including a free content-management system, free blog, free job board setup, and a free mobile version of your site. Contact us today at 1.888.696.2900 if you'd like to meet with us at this event. Mobile devices are taking over. By 2016, there will be 1 billion smartphone users and 126 million tablets in the U.S. alone. Is your staffing firm ready? If you're not mobile optimized, don’t miss this Lunch with Haley webinar where we'll address the big things you need to do - and the bad advice many staffing firms are getting - about mobile marketing and recruiting. 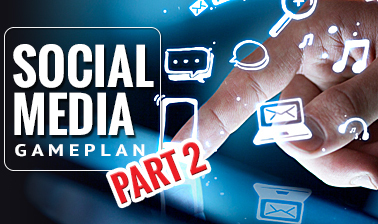 In Part 1 of this feature, we outlined how to effectively plan and integrate social media in your company's overall marketing plan. In Part 2, we break down the most popular social media channels and outline the steps you can take to turn these channels into recruiting and lead generation tools. SEO, you know it's important, but how do you effectively implement it for your website? We have updated our SEO eBook with tactical tips for developing content and implementing SEO to help your website rank higher on Google. This issue of the Idea Club is chock full of ideas to help you use social media and your website to engage clients, prospects, and candidates. We hope you enjoy it! And please give us a call at 1.888.696.2900 if you have questions about your website, social media or SEO strategies. We'd be happy to talk with you!